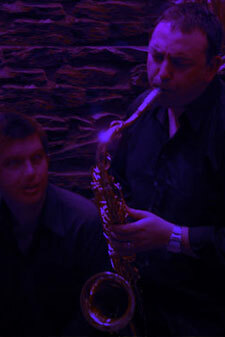 Jazz is my favourite music genre because at its best it showcases the height of human creativity – players encouraged to improvise with solos,complex melodies that live beyond the confines of pop, and yet, within this epicentre of competitive flair is strong foundation of structure demanding attention to teamwork among band members. The result is most often sublime. I recall a concert in Hungary late at night in a university theatre where the jazz band migrated from instruments to furniture with the leader performing a 20-minute solo with a wooden chair! I began writing songs back in the 1980s and continued through to the early 2000s. My influences were Coltrane, Cohen, and one of the other jazz Davises – Miles Davis. The photo you see here was taken in December 2010 at the BB Club, Adelaide. It was an impromptu performance that took place after I bumped in to Russell Webb from Chilled Observation. The rest was a blast. We belted out a few tunes, giving Leonard Cohen a jazzed up feel. Next up on the jazz calendar will be the contemplation of performing at another jazz festival. Is the jazz world ready for Leonard Cohen a la Jazz? PS The wikipedia links to some other musicians using the name, Steve Davis, can be found here and here.